Stovall slams into the Union line. Grose’s brigade, having just formed in the woods, is routed back into the field. There is some debate as to whether Dodge’s brigade retreats from its advance line. Dodge’s official report states that they stayed in the same place and held off all attacks. Some regimental reports say they fell back, one regiment specifically mentioning reforming behind the 2nd Ohio of Scribner’s brigade. However, the report of the 1st & 3rd Florida states that they were unable to get past the first line. King’s Regulars reported that the unit to the left retreated before the enemy, although it may have been Grose. In the end, its seem unlikely that the Regulars would have missed a brigade standing and fighting immediately to their left, especially since the woods in this area are fairly open and visibility was at least 100 yards, if not more. 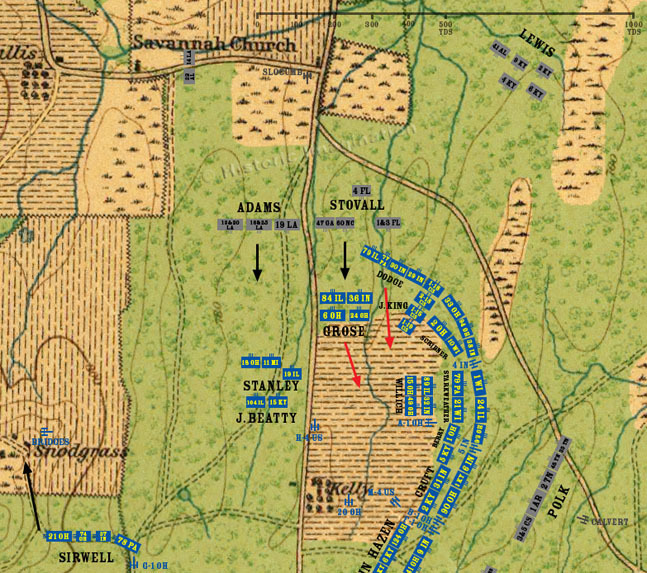 Maybe the men in Dodge’s brigade didn’t rout all the way to the south end of Kelly field, but more than likely they did retreat from Stovall’s attack and had to reform behind Scribner. Adams continues advancing through the woods to the west. Stanley's brigade awaits them to the south. Stanley has them lay down in an area of underbrush with the flags down, waiting to ambush the approaching Confederates, with the 19th Illinois slightly to the rear. General John Beatty has rallied his two remaining regiments and deploys them behind Stanley for support.